It is with great sadness that we announce the passing of Ruby Belmore (nee Bannerman) on October 27, 2018. Ruby passed peacefully at home, surrounded by family. Predeceased by her beloved husband of 64 years, Frank. Dear mother of Gregory (Doris), Catherine Brown (Phil), Douglas (Carol), and Michael. Doting grandmother of Cassandra, Mathew, Joshua, Angus, Hannah, Sarah, Laurel, Emily, Elijah and Scarlett. Ruby was the proud great-grandmother of Georgia, Freddie, Stanley, Ty, Elli, Rowyn, Porter, Hudson, Grayson, Charleigh, and three more grandbabies still on the way. Dear sister of Ruth, Roy, Margaret, George, Ivy, John, Ralph, Elaine, Grace, and Bob, Ruby is survived by many nieces, nephews, and cousins. Arriving at the height of the Great Depression, Ruby was one of 11 children born in the tiny southern Manitoba town of Baldur to Alexander, a WWI vet, and Fredfinna (Sara), an Icelandic foundling. Ruby remained fiercely proud of her humble hometown and her Icelandic and Selkirk Settler roots throughout her life. While the Bannerman family never had much in the way of material wealth, somehow they always managed to have a spare plate of food for whoever might show up on their doorstep needing a meal. Ruby lived her entire life according to the values she was brought up with in those tough times: love of family; selflessness and generosity; and resilience in the face of hardship. Ruby and Frank were active members of their cottage community, and she was never more at home than when she was working on her garden or organizing a playday for family and friends at Beckley Beach. 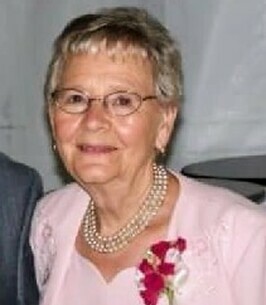 She was an avid curler and curling fan, and a long-time member of the Hamilton Victoria Curling Club. Cremation has taken place. A celebration of life will be held on Wednesday, November 7 at the Hamilton Victoria Curling Club, 568 King Street East, Hamilton, commencing at 1pm.